The governor of Samburu County HE Moses Kasaine was arrested by the EACC over a fuel supply scandal involving his county government. The scam has reportedly led to the loss of almost Sh90 million of public funds. The governor is in the process of being released on a Ksh10 million bail after the court reduced the earlier figure of Ksh100 million. 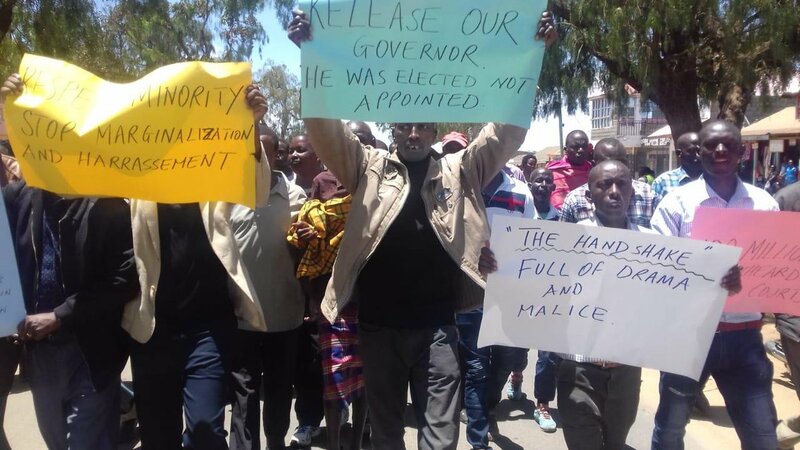 A section of Samburu residents took to the streets to demand for his release claiming that he is an elected leader, not appointed, and thus deserved more respect than he was currently being accorded as a guest of the state. The residents, through posters and leaflets, have chosen to blame the handshake for their governor's troubles saying the handshake between president Uhuru and Raila Odinga has only brought confusion in the country. Resident of Samburu County taking it to the streets of Maralal Town, they want their Governor Moses Lenolkulal who charged with graft scandal released.